When building applications, or more specific, when resolving bugs in your application the initial reaction of a lot of developer is to resolve the bug first thing. Another approach is to first proof your bug is indeed a tangible bug by writing a test script to proof it. Even though you might be natural inclined to quickly resolve the bug a lot of value can be found in proving it first. By applying a test-driven development approach the first thing you will do is write a short test script that will inform you that the bug is present. After that you can write the fix for the bug and re-run the test script. Now, with the bug resolved, the test script should inform you that everything is working as expected. The value in in this approach is that, with every bug you resolve, you will add to the set of tests for your application. 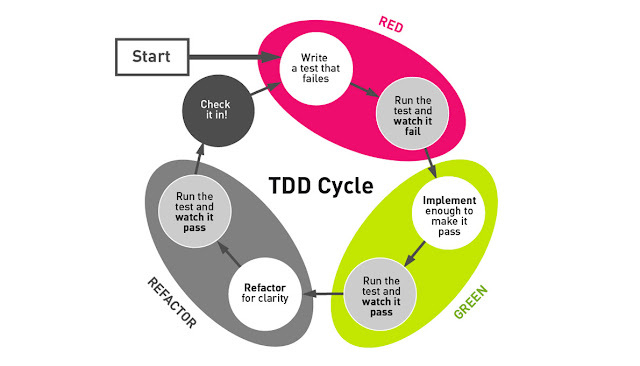 When done right you should have an automated test step in your CI/CD pipeline. This means that every time you build, test and deploy a new release of your application the application will be tested for every bug ever found in your application and make sure that it has not occurred again. Implementing an automated testing strategy in combination with test driven development is not only applicable when resolving bugs, it should also be part of your new functionality development cycle. Every time you develop a new functionality it should be accompanied with a test script. As stated, when you have implemented your CI/CD strategy correctly and made sure that you have a test step in your pipeline every execution of your pipeline should result in all tests being executed automatically. When the execution of tests is a manual process by developers or even worse a process that needs to be requested with a specific test team the changes are high testing is happening less frequently than it should be. By ensuring that testing is an automated part and your CI/CD pipeline enforces the execution fo all tests makes sure that you know that your application is tested over and over again to make sure all functionality is available and that bugs that have been resolved in the past do not surface again. If you develop a web application the use of tools like Selenium can be extremely valuable. Selenium allows you to run tests fully automatically and has support for multiple browsers. When writing your selenium test it is good to know that Selenium is fully working on Oracle Linux and that you can use this in a headless mode. The benefit of the headless mode is that you can run virtual Oracle Linux machines and have them execute the Selenium tests without the need to have a graphical user interface running within your Oracle Linux instance. The below code snippet shows a test case for Selenium written in Python capable of running with FireFox on an Oracle Linux instance without the need to have a graphical user interface. One of the models to run your Selenium test quickly is to use an Oracle Linux based Docker container and have the test running within the context of this container. There will be no need for any graphical user interface and due to the way the Oracle Linux base image for Docker containers is provided the size of your Docker image will be minimal. Develop a simple Selenium image based upon the Oracle Linux Docker base image. The simple Selenium image should be able to download Selenium tests from a central repository and execute them. This means that you can keep your Selenium image relative simple and you will not have a need to rebuild the image every time you add a test to your test set. Every time your pipeline will invoke the testing stage you Oracle Linux based container will download the latest version of a test as part of the bootstrap process. One thing to remember is that you need to ensure that your container will report the test results to a central location to ensure you will have all the test results after the container has stopped.